Alkylation of hydroxyl groups of flavonoids is known to increase their bioavailability, metabolic stability and also impart new bioactivities. Though partially alkylated flavonoids and related compounds occupy substantial chemical space, there is scant information on their biological activities. They are comparatively less accessible, therefore development of their general syntheses are desirable. 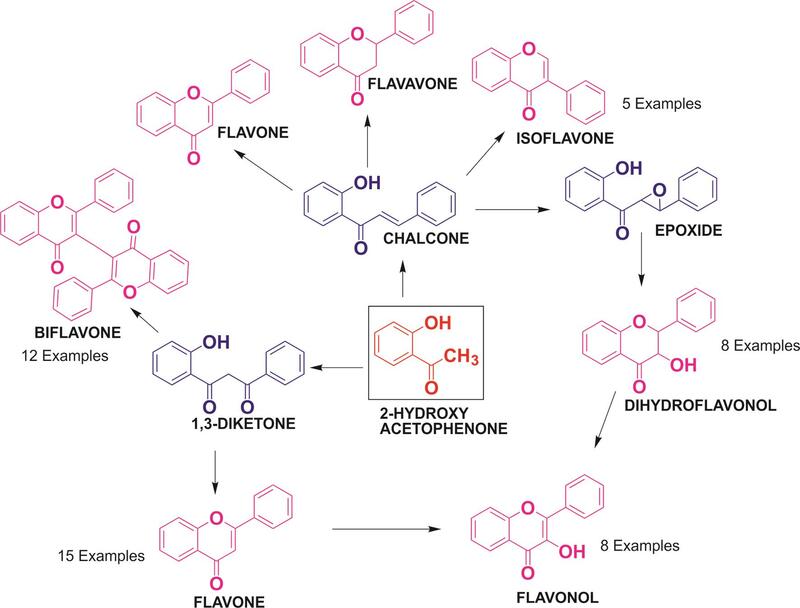 Chalcones play key role in the biosynthesis of array of flavonoids. Taking cues from nature, bioinspired, ecofriendly syntheses of polyhydroxy- and partially alkylated flavonoids have been developed. Compared to conventional protection groups, methoxymethylation was found to be more useful for the protection of hydroxyl groups. A library of flavones, flavonols, isoflavones and biflavones has been prepared. A brief account of our ongoing effort towards syntheses of small molecules is summarized here. Biological screening of the synthesized compounds led to recognition of several hitherto unreported inhibitors of biomarkers for MMP’s, NFkB, carbonic anhydrase etc. Growing number of pathogenic microbes are acquiring resistance against the existing drug regimes. This has necessitated the search for new drug molecules. The natural products provide great chemodiversity. Prominent phytochemicals such as quercetin, kaempferol, luteolin genistein etc. have been subjected to detailed biological investigations. But, of late it has been realized many of these molecules may not be the actual active principles but are prodrugs and express their activities after metabolic transformation or activations.1 The actual active principles may be the metabolites rather than the parent compounds. Therefore, easy access to the metabolites is very desirable for drug discovery programs. It has been established that most of the dietary polyphenols that are ingested, undergo rapid transformation into more soluble products by conjugation such as glucuronidation or sulfation. For example, common flavonoids such as quercetin, kaempferol, diosmetin, and resveratrol, are metabolized before reaching the target organ.2 Methoxylated flavones may undergo demethylation by the tumour specific enzymes to hydroxy flavones.3 On the other hand demethylation may be a process for bioactivation of naturally occurring prodrugs. Some reports suggest that the polyhydroxy flavonoids are metabolized in the biological systems into more bioavailable partially protected forms (e.g., methyl ethers) which may be the actual bioactives entity. The study of biological properties of analogs of the parent compounds such as partial methyl ethers and other intermediates could be a good strategy for drug discovery. Though apparently simple, the procurement of the partial methyl ethers may not be a straight forward process. The natural occurrence of such compounds, if available are sporadic and present logistic problems for collection and isolation. The access to these compounds by conventional syntheses is possible but involves extensive protection and deprotection of functional groups and adds additional steps in the syntheses thus making them lengthy, time consuming, and ecologically unsound.4 The availability of regio-specific syntheses of methyl ethers thus become very crucial for drug discovery studies. In nature most the flavonoids occur as polyhydroxy compounds and have been subjected to many investigations including studies in human nutrition and metabolism. Not much attention has been paid to the bioactivity of small molecules containing hydroxyl as well as methoxyl groups (partial methyl ethers) though they occupy substantial chemical space. Lack of ready availability of such compounds could be the main cause for this apparent neglect. This led us to develop bioinspired, divergent, green syntheses and an array of compounds with different molecular architectures were prepared. Chalcones are the central molecules in the biosynthesis of flavonoids.5 These are suitably functionalized molecules and are amenable for a variety of chemical transformations. They are readily accessible synthetically by Claisen condensation from the commercially available compounds with varied substituents. Taking inspiration from nature, we have utilized suitably substituted chalcones for many of the syntheses described below. Protection of hydroxyl groups is one of the most common step for the syntheses of polyphenolics. Many methods for protection of hydroxyl groups are known. Methylation or benzylations or benzoylation are typically used for the protection of phenolic hydroxyls. They can be deprotected by several methods such as hydrogenolysis or dealkylation. Thus protection and deprotection increase steps in the syntheses. Methoxymethylation (MOM) have certain advantages for protection of hydroxyls.6 MOM derivatives can be synthesized easily. Being hemi-acetals, they are stable to bases but can be deprotected under mild acidic conditions. We have explored the compatibility of MOM under different experimental conditions. MOM for protection has been used under different reaction conditions such as in the syntheses of flavonols, dihydroflavones, flavones, isoflavones and biflavones. A brief of account of syntheses is given below. The synthesized compounds were subjected to screening for several bioactivities and hitherto unreported activities were discovered. The bioactivities of the compounds will be discussed elsewhere. Fig. 1 Synthesis of flavonols. Fig. 2 Synthesis of flavones. Amongst biflavones, (I-3, II-3)-biflavones are comparatively rare. Due to their limited occurrence not much is known about their bioactivities. In a novel approach, 1, 3-diketones were dimerized to tetraketones using cerium ammonium nitrate (CAN) oxidation (Fig. 3). The 1, 3-diketones were obtained by the BV reactions as described above. The tetraketones on double cyclodehydration gave (I-3, II-3)-biflavones with good to excellent yield (78–88%). In practice, it was found that the dimerization of 1, 3-diketone and cyclodehydration take place sequentially in the same flask without the need for isolation of the tetraketones. Using this one pot reaction, eleven (I-3, II-3)-biflavones, with different hydroxyl/methoxyl groups were synthesized and screened for matrix metalloproteinases inhibitory activities (MMP-2 and MMP-9). Among compounds tested biacacetin was found to be the best inhibitor.14In silico docking studies suggests that (I-3, II-3)-biacacetin inhibits the gelatinases through non-zinc binding interactions. The non-zinc binding nature of (I-3, II-3)-biacacetin is an important factor for designing selective molecules of therapeutic importance through inhibition of MMP-2 and MMP-9. Fig. 3 One pot synthesis of (I-3, II-3)-biflavones. Isoflavones are important nutraceuticals. They are well known constituents of phytoestrogenic foods. The biological activities of soybeans have been attributed to isoflavones. The major isoflavones identified in soybean are genistein, biochanin-A, formononetin and daidzein. Oxidative cyclisation of chalcone by thallium (III) nitrate to isoflavones is one of the widely used method for their syntheses.15 However, this procedure does not work well with chalcones with unprotected hydroxyls. We have shown that these reactions proceed smoothly with the MOM protected chalcones. Using this method, MOM-protected chalcones were converted into hydroxylated/ partial methylated isoflavones using thallium nitrate (Fig. 4). Soya isoflavones such as genistein, biochanin A, formononetin and daidzein were also efficiently synthesized. Recently the crude extracts of soya have been reported to have anti-biofilm activity.16 However the active principles were not identified. Therefore attempts were made to identify the active principles. Attempts were made to relate the activity with the active principles. Individual pure compounds were subjected to screening for anti-quorum sensing activity. Of all the compounds, diadzein and formononetin were found to be the effective against Chromobacterium violaceum, Staphylococcus aureus, Pseudomonas aeruginosa and Candida albicans. Fig. 4 Synthesis of soya isoflavones. Due to lack of convenient synthesis of lesser known flavones such as partial methyl ethers have not received adequate attention for their bioactivities. We have developed convenient bioinspired syntheses and generated library of such flavonols, flavones, isoflvones and biflavones (Fig. 5). As a result of screening of compounds, readily accessible novel inhibitors of biomarkers like MMP-2, MMP-9, NFkB, carbonic anhydrase were discovered. Fig. 5 Bioinspired diversity oriented syntheses of oxygen heterocyclics. Contributions of my colleagues who were associated with the work are acknowledged through the references mentioned below. I thank Dr. Bipin G. Nair, Dean, Amrita School of Biotechnology, for his keen interest in this work. I also acknowledge the help of Sri N. Pandurangan and Sri Chinchubose in the preparation of this manuscript. I gratefully acknowledge the financial support and facilities provided by the Amrita School of Biotechnology, Amrita University, Kerala, India. The author has no conflict of interests related to this publication. Experimental design and drafting the manuscript (AB).